NOT cheating: If companies cheat with information about high and low quality, they will lose return on their brand investments and the total reputation of the company. Umbrella branding: same name used for many products as a signal that new launched products have the same quality as other products of the brand. Brand as signal – A brand becomes a signal when the marketing strategies of firms in the past and present are symbolizing the firm. An importance of a signal is also characterized by credibility and clarity. 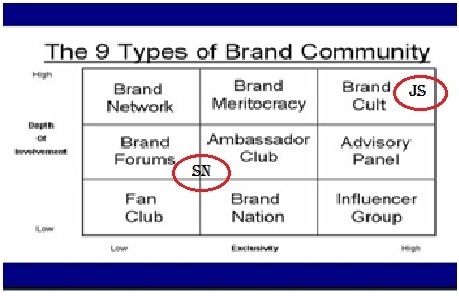 Brand community – A community formed on the basis of attachment to a product or marquee. Recent developments in marketing and in research in consumer behavior result in stressing the connection between brand, individual identity and culture. Consciousness of Kind – the existence of a common enemy against whom to unite makes this brand community particularly strong. The story of the company began in 1987 when company founder Peter van Stolk recognized the potential of emerging “alternative” products in the beverage industry. Jones Soda has always been about the people and interacting with the consumer. From the ever changing photos on their labels, to their website www.jonessoda.com. Jones Soda has created a cult following and is a passion among soda drinkers. Jones Soda is a carbonated beverage firm that solicits customer co-creation from a community of devoted fans. The firm gives its 12- to 24-year-old target consumers input into product innovations (flavors), packaging (labels, cap quotes), promotions (stickers, Web content, price points), and advertising. Through the Jones Soda Web site, consumers are asked to rate suggested new flavors and are invited to submit photos and copy that would fit in advertisements and on the packaging. Jones Soda has more than 830,000 in Facebook and more than 1,000,000 followers in twitter. How have the two brands positioned their communities? Thanks Figen, Pim and Georgi…for the post and the presentation in class!! And thanks fot bringing up the final table…loved it! !